When traveling it is important to take along a first aid kit for emergencies. Take along bandages and antibiotic ointment for any cuts and scrapes you might get. Also keep in mind, travelers often have stomach trouble from the stress of traveling, change in diet and different organisms in the water that your body is not accustomed to. Be sure to pack anti-diarrhea medicine and Tums for any stomach problems you might have. "Which adapter plug do I need when I travel abroad?" is a question Going In Style often gets. Most Apple products charge via a two prong, nongrounded plug, therefore you will need a nongrounded adapter, that corresponds with the country you are traveling to, in order to charge your iPhone 7. You can easily search for the adapter or adapters you will need for your destination country using our adapter list of countries listed alphabetically from A to Z. Simply click on the letter of the country you will be traveling to, then click your destination country. In order to charge your iPhone 7, you will need the Basic (nongrounded) Adapter Kit with the black adapter(s). Many customers order the Deluxe Adapter Kit so they can have extra adapters. Having additional adapters means you can charge your iPhone 7 and your iPad at the same time. LONDON London is a charming city despite the fact that it rains in London one-third of the year and half of the days of the year are overcast. London is a drizzly destination that receives rain every month out of the year, getting about 24 inches of rain per year. Winters can be quite chilly, averaging about 35 degrees Fahrenheit in January and February with a chance of snow. Summers are usually in the comfortable low to mid 70s, yet there is always a chance of rain with an average of 8 rainy days per month in the summer. Shop London, England Adapters. Why Does The United Kingdom Use a South Africa Adapter Plug? If you are traveling to the United Kingdom, you will need adapter plugs to charge your cell phone, iPad and power your laptop computer. England uses two types of plugs. One plug is called the United Kindgom plug (GUD) and has three rectangle pins. The other plug used in England is the South Africa plug (GUE) that has three large round pins. So why does England use a South Africa plug? It is common for countries to have more than one type of outlet. Most areas in England will use the GUD plug, however in some older parts of England you might see an outlet for the GUE plug. The reason that South Africa and England share a plug type is because the British Empire controlled South Africa for quite some time. Most likely when you are in England you will encounter the GUD plug, but it is prudent to take along the GUE plug just in case. Many countries share adapter plug types so don't be surprised if an adapter works in more than one country worldwide. 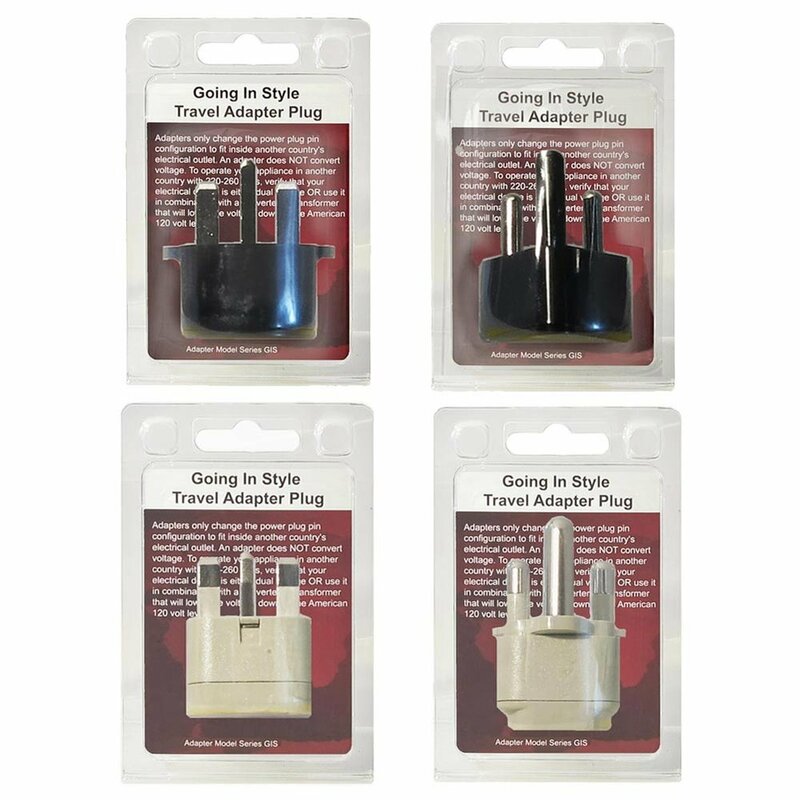 You can always check Going In Style's Adapter Guide to make sure you have the correct adapter for your trip. My Appliance Plug Wont Fit Into My New Adapter Plug. Help! Some customers are concerned when it seems as though their power plug wont fit completely in the female side of the adapter. Your power plug will fit, you just need to push hard the first couple of times you use your adapter. The adapter plugs are designed to fit snuggly so you have a tight connection. The alternative would be if the power plug fit loosely, then there would be safety issues. Your power plug could fall partially out of the adapter and cause electric shock. For safety, Going In Style adapter plugs are designed to fit tight. The first few times you use your adapter the connect will be very snug, but will loosen up after a few uses. If you are having trouble inserting your power plug into the back of your adapter ask someone who is stronger to help you push the power plug in all the way. Then disconnect the power plug from the adapter and insert it again. Do this a few times until the adapter loosens up and your power plug glides in more easily. When traveling with an iPad or Apple device you simply need to bring the correct adapter plug for the country you are visiting. Plug your iPad into the adapter and then plug your adapter into the countries wall outlet to charge your device. Apple products, such as your iPhone, iPad and laptop, are dual voltage, therefore you do not need a converter. You can tell if you if your electronic device is dual voltage by looking on the voltage rating on the device. If you are traveling with a Macbook laptop computer, you may want to bring along a surge protector to keep your computer safe when connecting to foreign power supplies that can be unpredictable. 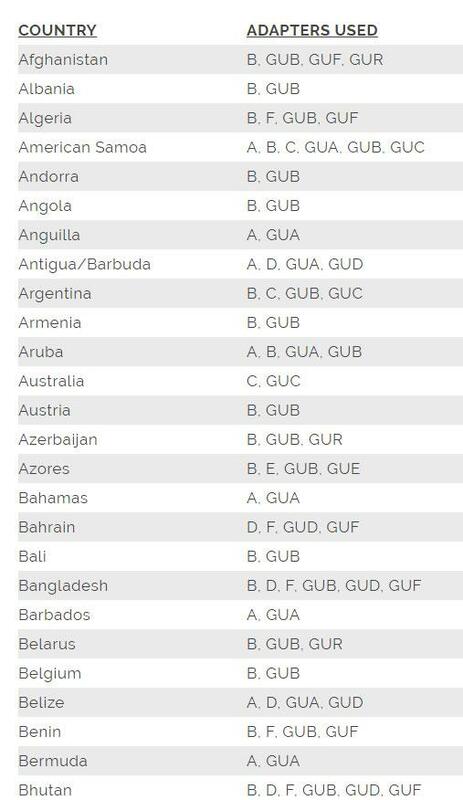 Going In Style has listed countries alphabetically. Simply click on your destination country to see what adapter plugs you will need for your trip. For a demonstration on how to tell if your electronic device is dual voltage, watch Going In Style's Video on Dual Voltage. Should I Take a Powerstrip On My Trip? Going In Style's Travel Power Strip Dual Voltage with Surge Protection is the perfect travel companion for the techie. Traveling with a travel power strip means you can bring less adapters with you on your trip. The power surge protector requires one grounded adapter to be plugged into a foreign country wall outlet. When traveling overseas, some International hotels may not have enough accessible electrical power outlets. With the travel power strip you multiply how many outlets you have access to in your hotel room. Travel Power Strip has three AC ports with surge protection so you can plug in your laptop and charge your cell phone and camera battery pack at the same time. When traveling with a laptop you most likely will not need a converter, however, you do want to make a safe connection with surge protection. Foreign electricity can be unpredictable and power surges are possible. With the Travel Power Strip with built in surge protection you can rest assured that you laptop is safe from power spikes. With the Travel Power Strip you don't need to pack an additional surge protector for your laptop. Since Going In Style's Travel Power Surge Protection Strip has a US / North America type plug, you can use your power strip at home as well as while traveling. Power Strip is also dual voltage and will work in any country world wide with the correct grounded adapter plug. It is important to remember that the Power Strip does not convert electricity. All your devices that are plugged into the power strip while in a foreign country need to be DUAL VOLTAGE. If you are traveling with an iPad, iPhone, Samsung Galaxy, Android phone, or Kindle, these devices are DUAL VOLTAGE and can be safely plugged into the power strip world wide without a converter. The compact design and space-saving cord management system make it easy to take with you on all your trips. Use the Power Surge Strip to keep electronic devices charged and ready to go at all times. *The Travel Power Strip uses a grounded North American plug. A Grounded Adaptor Plug may be needed to connect to 220-240VAC foreign electrical outlets. Adapter Plug Naming Convention - What Adapter Do I Need? Many customers ask about the adapter naming convention. Finding the correct adapter for the country you are visiting can be confusing. Going In Style has a unique naming convention for our adapters. Other companies name their adapters differently. Lets take a look at Going In Style's naming convention. Non Grounded Adapters are named A, B, C, D, E and F. The A plug is the North America non grounded adapter plug. An adapter plug can work in many different countries. A North America plug will work in Canada, United States, Mexico, Panama, Puerto Rico, Virgin Islands, etc. These are all countries in North America. However, the North America Plug also works in Japan, Korea and Vietnam. These countries are not in North America. Adapters are given a one letter name and then matched to the countries that use that plug. Grounded adapter plugs are given a three letter name. Going In Style's grounded adapters are named GUA, GUB, GUC, GUD, GUE, GUF, GUI, GUZ and GUS. The North America grounded adapter plug is named GUA. GUA plug works in most countries in North America and also works in some Asian countries such as Taiwan, Japan and Thailand. Adapters are given a short lettered name so the adapter type can be easily identified and matched to its appropriate country. It is important to stay hydrated while you travel especially when traveling by plane. Airplane cabins have low humidity and dry air. Staying hydrated can help you avoid jet lag and feel better when you arrive at your destination. LIMITED TIME ONLY Mycra Pac Long Raincoats are Back! You know the old saying, “You don’t know what you got until its gone”, and that saying hits close to home when it comes to the Long Length Mycra Pac Raincoats. Mycra Pac Donatella Long Raincoat was and incredibly popular style of raincoat in the past. The long, sweeping length made these raincoats elegant and perfect for the opera, formal wedding or fancy dinner. Now, back by popular demand, for a limited time only is the Long Donatella Mycra Pac Raincoat. 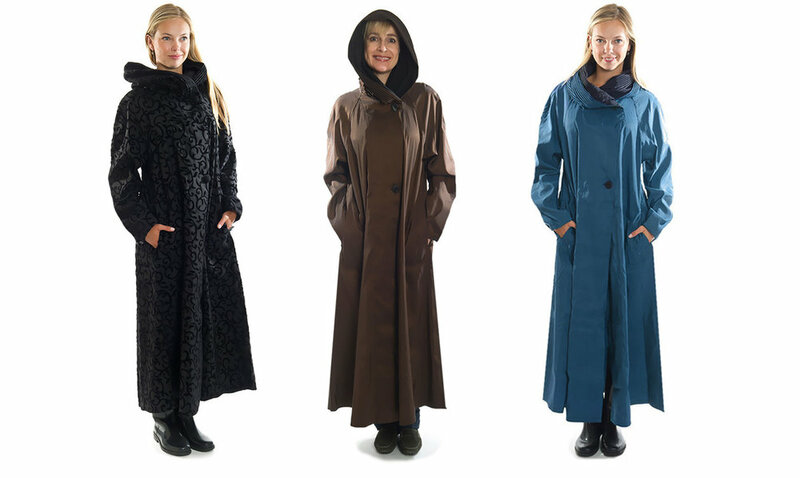 If you loved the long length of the Mycra Pac Donatella Long Raincoats and your old raincoat is ready for an update, now is the time to buy. Mycra Pac Long Jackets will be back in time for Christmas, but for a limited time only. Mycra Pac Long Donatella Raincoats will be available in colors Sapphire and Bronze in sizes S/M and M/L and Black Scroll and in sizes Petite to M/L. When traveling to Europe with a Samsung phone you will need to take along the correct adapter for your destination country plus your regular phone charging cord. Most countries in Europe including France, Denmark, Italy use the Continental European two round pin adapter plug. Going In Style carries a new adapter plug for Europe that has two USB ports for charging your Samsung Galaxy and your tablet at the same time with a USB charging cable. Simply plug the adapter into European wall outlet and plug your USB charging cable into the bottom of the adapter. 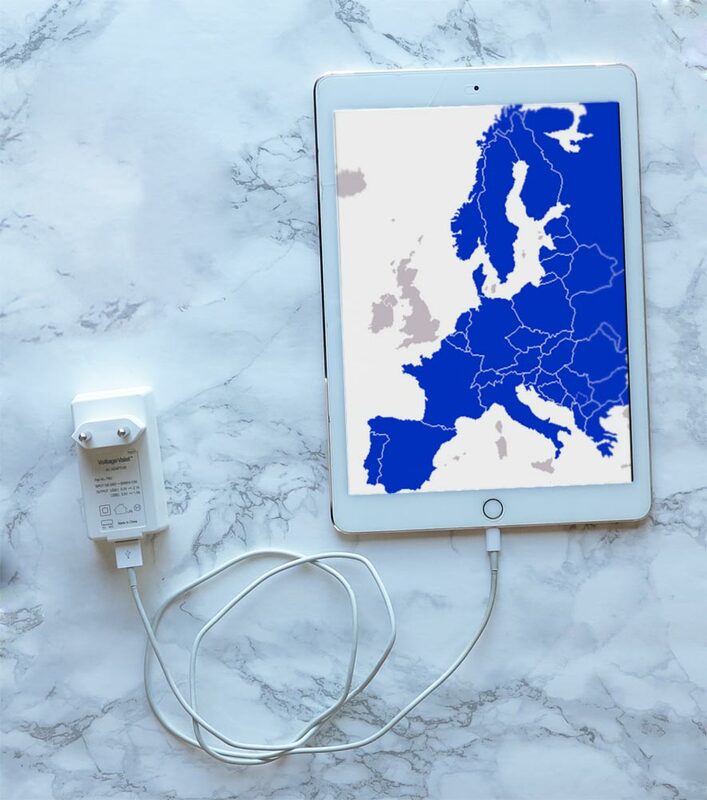 Going In Style's new Twin USB Port Europe adapter plug is a great choice if you are looking to charge your phone, tablet, and e-reader on your next trip to Europe. Nongrounded Europe adapter accepts polarized nongrounded electric plugs as well if you need to plug in your camera battery. What adapter plug or adapter plugs do I need for Israel? RFID stands for Radio Frequency Identification, or Radio Frequency ID. This means that identification information and data can be transferred through radio frequency. RFID technology has a wide range of uses in to today's society. RFID can be used to pay for groceries by scanning your credit card instead of sliding it. 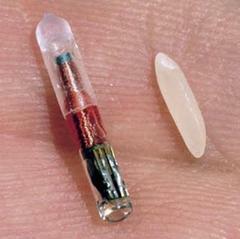 Another great use for this is micro chipping your dog or cat. The micro chip is about the size of a grain of rice and can contain all sorts of important data about your pet including their name, address, owner's phone number, and vaccinations. The chip can be scanned through the skin if your pet is ever lost and hopefully your pet can be returned to you quickly. RFID chips are used in all US passports created after 2006 and in over 35 million credit cards. Microchip technology was designed to let us bypass the standard requirements of scanning or checking in. However, electronic identity thieves have undermined the security of RFID products by devising scanners that read your personal information without you even realizing it. The possibility of thieves being able to read personal information has become a concern because of the ease of data transfer. Someone couldtransfer personal information without your consent. It's very important to choose products with RFID blocking features because RFID chips are in personal identification items such as passports (all passports issued since 2006), credit cards, and debit cards. Thieves will use handheld RFID Readers or Scanners to intercept personal information. What Size Of Carry On Should I Buy? Choosing the correct carry on size can be tricky because each airline sets their own carry on size restrictions. Going In Style recommends thinking about whether you spend more time traveling domestically or international. International carry on requirements are generally smaller. HOW LARGE CAN MY CARRY-ON SUITCASE BE? Carry-On sizes can be a bit confusing. Airline carry-on restrictions vary from airline to airline as well as from airplane to airplane. For accurate information please contact the airline you are flying with for their baggage limitations in advance. Carry On size can even vary depending on whether you are traveling International or Domestic within the same airline. One of Going In Style's favorite carry on luggage brands is Briggs & Riley Carry On Suitcases. Briggs & Riley carry on luggage comes is super durable and comes with a Briggs & Riley lifetime guarantee. TIP: When purchasing carry on luggage in store, Going In Style recommends bringing along a tape measure. Measure the luggage to make sure it actually fits withing the size of carry on regulations including the wheels. Sometimes luggage on sale or discounted carry ons are discounted because they don't quite meet airline carry on sizing regulations. You don't want to buy a brand new carry on luggage and then be charged for an oversize carry on once you get to the airport. Carry on Bag Dimensions 22 inches x 14 inches x 9 inches / 56 cm x 35 cm x 22 cm including wheels and handles. Personal items that are approved are 1 purse, briefcase, camera bag, diaper bag, or laptop computer. Carry On Bag Dimensions maximum outside dimensions of 45 linear inches including wheels and handles and fit in the overhead bin. Personal Item such as purse, daypack, backpack, briefcase, shopping bag, laptop computer or diaper bag. Personal Item Dimensions 17 inches x 10 inches x 9 inches / 43 cm x 25 cm x 10cm (If you are flying Basic Economy ticket, your personal item will be the only item you can bring on board). Carry On Bag Dimensions maximum outside linear dimensions of 51 inches including wheels and handles and fit in the overhead bin. Briggs & Riley Silver Luggage is Here! Coming September 2018, Briggs & Riley is releasing their Special Edition Sympatico Silver Suitcases. Briggs & Riley celebrates their 25th Silver Anniversary this year, and are celebrating with a special line of Silver Hardside Luggage from their Sympatico Collection. Briggs & Riley offers a Lifetime Warranty on all their luggage so you don't need to worry about wheels wearing out or hardware breaking down. Going In Style offers free shipping sitewide on all Briggs & Riley Luggage. Sympatico Silver Suitcases are sure to have you shining extra bright on every lag of your trip. Sympaitco Silver Spinner Luggage rolls effortlessly on four 360 degree spinner wheels. Limited Edition Sympatico Silver Suitcases have all the same fantastic features as the other Sympatico Hardside Suitcases. Sympatico Silver is a coordinated collection that combines hard spinner cases that pair beautifully with the Sympatico softside backpacks and briefs. Take them together and get rolling or remove one and conveniently carry it with you. Briggs & Riley Silver Suitcases will be sure to outshine all other luggage at the airport. As Briggs & Riley embarks on this milestone year marking their 25th Silver Anniversary, they are proud to continue their commitment to their brand pillars of innovation, performance and style. These three core components fuel their overarching goal to provide top-notch service to global travelers. As an independent, family-owned brand and the only one in the luggage industry to offer a lifetime performance guarantee, Briggs & Riley strive to bring you the latest innovations. 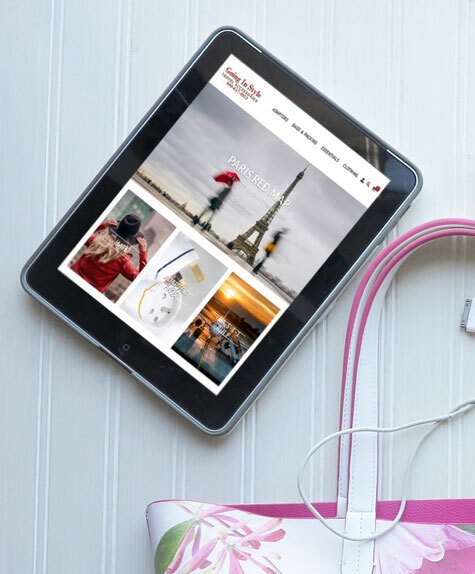 From creating product with cutting-edge functionality, to providing an outstanding customer experience, Briggs & Riley is passionate about making travel, well..., easier. What is the difference between an adapter and a converter? Going In Style gets this question a lot. An adapter changes the plug configuration so your US power plugs fit into the wall socket in the foreign country you are visiting. A converter changes the electricity so you can use your NON-DUAL-VOLTAGE appliances when visiting a foreign country. Chances are, if you are traveling to a foreign country, you WILL need an adapter plug to plug your smartphone, tablet, laptop computer, hair dryer and other appliances into the wall outlet to charge. United States power plugs have two flat pins, while another country, such as the United Kingdom, power plug's will have three large square pins. The pin configuration on your US power plug will not fit into the wall socket in the United Kingdom unless you bring along an adapter plug. Now that you have your adapter plug, do you still need a converter? The United States operates on 110-120 volt electricity while many foreign countries, such as Australia, operate on 240 volt electricity. If your appliances are NOT dual voltage, this difference in electricity can damage and blow out appliances such as your hair dryer. Most electronics on the market today ARE dual voltage and do not require a converter. Smartphones, kindles, tablets and many laptops are dual voltage. ALWAYS CHECK TO MAKE SURE YOUR ELECTRONICS AND APPLIANCES ARE DUAL VOLTAGE before leaving for your trip. Do check to see if your hair dryer or other appliance is dual voltage, there should be a label on your hair dryer that either says 110 - 120 volts (which would not be dual voltage) or 110 volts - 240 volts (which would be dual voltage). If your hair dryer says the later, then it IS DUAL VOLTAGE and will work in foreign countries such as Australia. If you hair dryer is NOT DUAL VOLTAGE then you will either need to purchase a travel hair dryer that is dual voltage or purchase a converter. Going In Style usually recommends purchasing a hair dryer made specifically for travel in this case. Converters can be heavy and bulky and take up unnecessary room in your luggage when you are trying to pack light. A travel hair dryer will usually be compact, lightweight and sometimes foldable, and quite easy to pack in your suitcase. In summary, if you are traveling to a foreign country, you will most likely need to bring along an adapter. However, you only need a converter if your appliances are not dual voltage and not compatible with the electricity in your destination country. You can avoid packing a converter by making sure all your appliances are dual voltage before you leave for your trip. For a step by step tutorial on How To Tell If My Appliance Is Dual Voltage? Watch the video on dual voltage appliances. Planning a trip can seem overwhelming with so much to do before your flight and so many items to remember to pack. Going In Style has a comprehensive pre-departure and packing checklist to help you plan for your trip. Going In Style also has a printable version of our Packing Checklist. New Gabby Mycra Pac Raincoats Available Now! When traveling to rainy destinations such as Paris, London and Tokyo, you want to bring along the travel gear to keep you dry and comfortable. Mycra Pac Raincoats are a beautiful option for a stylish and practical travel raincoat. Mycra Pac coats are water resistant, wrinkle resistant and fold up into their own travel tote bag. New Gabby rain jacket is a super comfy raincoat with a two way stretch fabric for easy movement. Cute inside lining features patterns such as gingham and polka-hearts that peak through on the underside of the hood and rolled up sleeves. Going In Style currently carries Gabby raincoats in the colors Black and Blue.